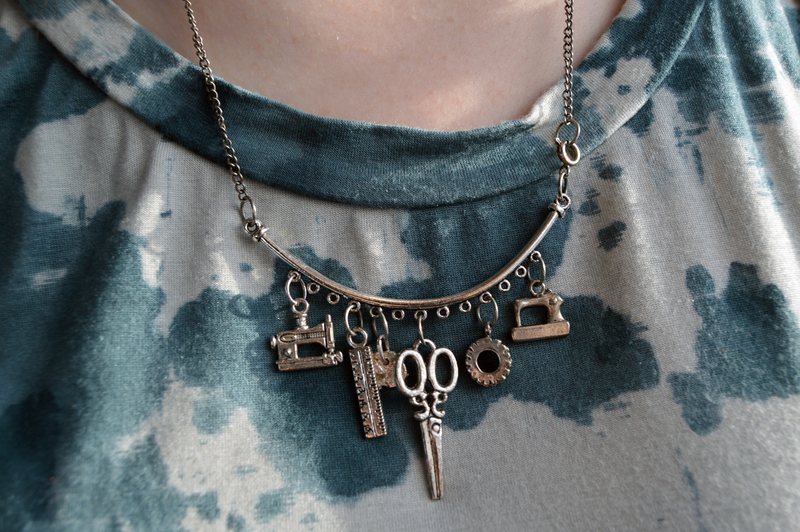 But now for myself, I’ve made the first of what will be a slew of t-shirts – in the quest for the perfect t-shirt! I already had the perfect t-shirt of course, but after years of faithful use, it was falling apart. I finally took a seamripper to it, and used the pieces to trace off new master pattern pieces. I traced off both left and right sides, averaging out the two. 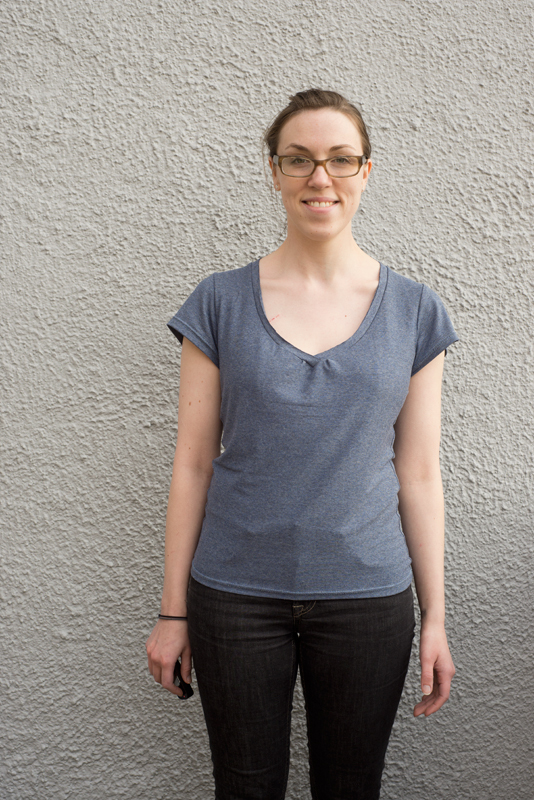 Pattern: Self-drafted from a beloved old H&M t-shirt. Techniques: jersey fabric, neck binding, serged seams. 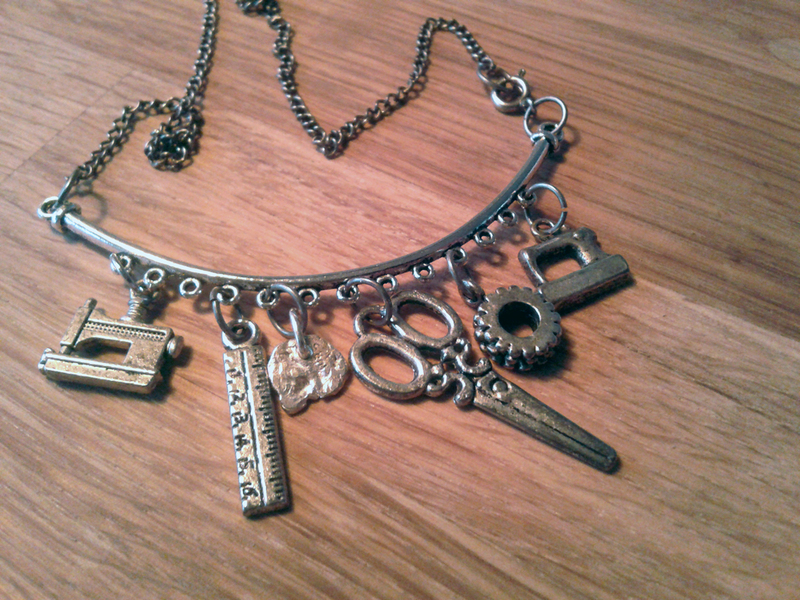 This was quite a quick make! It took me 10 minutes to cut the fabric last night, and since I worked a later shift today I actually managed to sew it up in the morning and wear it to work, yey! How’s that for a productive start to the day? 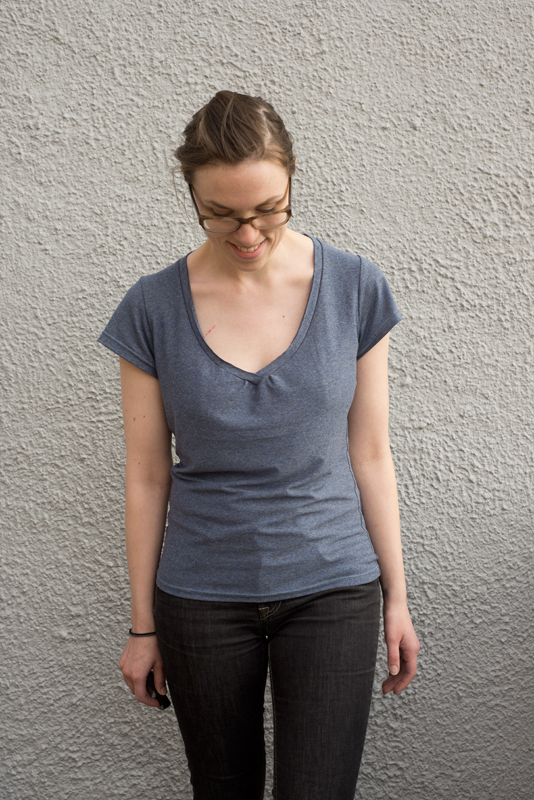 The fabric is a lovely heathered bluish grey, and very soft and drapey. 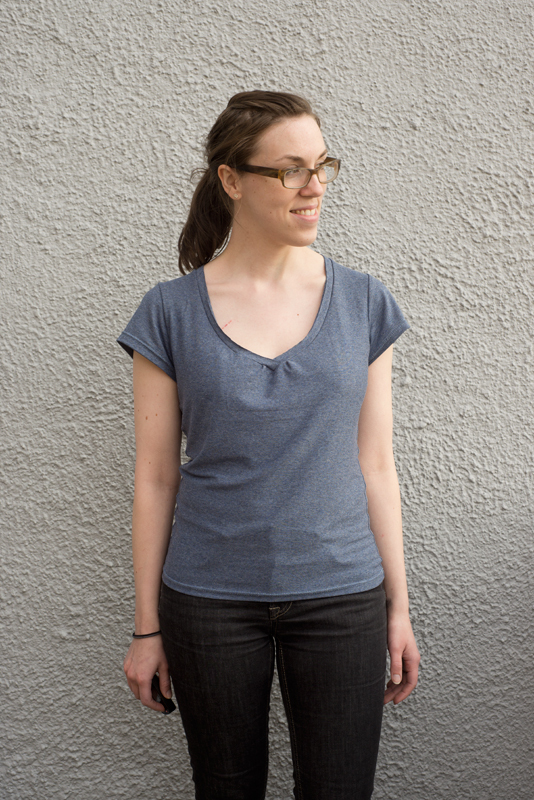 It’s a little more substantial than the original t-shirt, which was almost a whisper thin cotton jersey, so I was a little worried it would drape differently. It’s not too far off though! And of course, as a first try, there are things to be changed for future versions, which I was anticipating. I’ll be adding a couple of inches to the hem, since the slightly too narrow fit at the hips means the t-shirt rides up a little. The sleeves jut out a little more than I’d like, so I’m thinking of taking out a wedge from the center of the sleeve to narrow it. 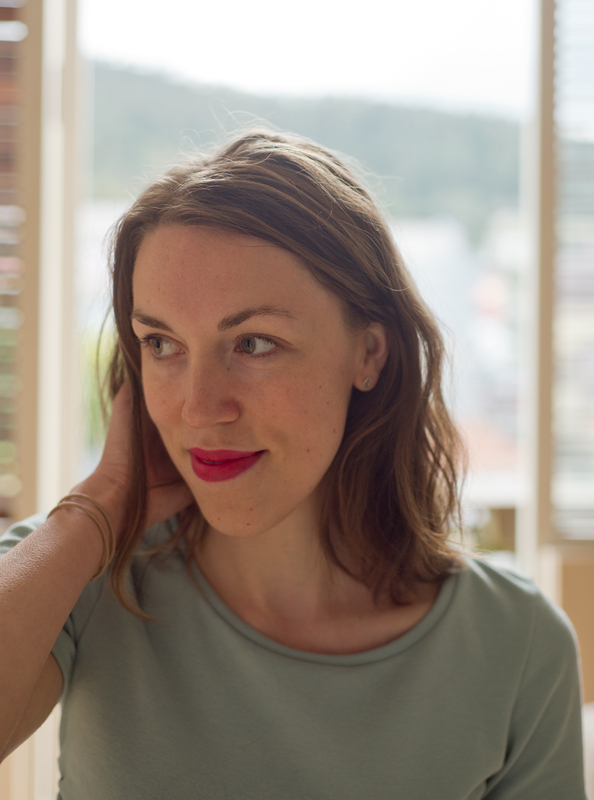 Ooo, I came across the most wonderful explanation of sleeve cap shapes on a blog, I really recommend this post in particular, and her blog in general if you have any interest in patternmaking and/or fitting. Anyways, that post shows the mechanics behind why I don’t want to narrow the sleeve too much, since the sleeve cap would get taller, and therefore more difficult to sew in flat to the armscye before sewing the side seams in one fell swoop. Never mind the scratch – kittens are vicious things! No, not really, just very sharp-clawed. Enough technical talk! I have a lovely weekend planned with what’s looking like beautiful weather, a pub quiz with colleagues, a school reunion, and a Sunday hike. Anyone else have a nice weekend planned? … Wendel socks! 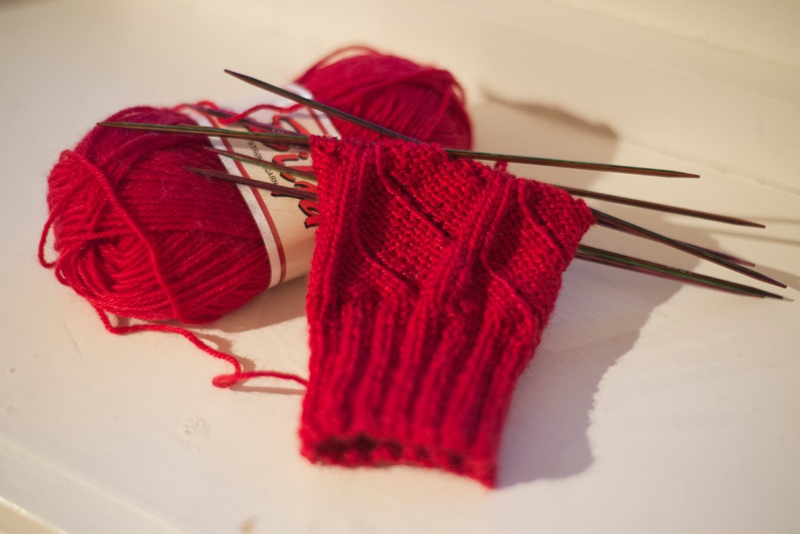 They are red, they are bright, they are for John, and they have a really cool geometric pattern (ravelry project page here). I had several false starts with this pair. My yarn isn’t quite right, so everything was turning out way too big. I ended up trying four or five different things before settling on a stitch count and combination that worked. John picked the color and approved the pattern, and I’m really liking the shapes that are emerging. I didn’t quite believe all the comments that the stitchpattern was easy to memorize – but it really is! I’m getting closer! 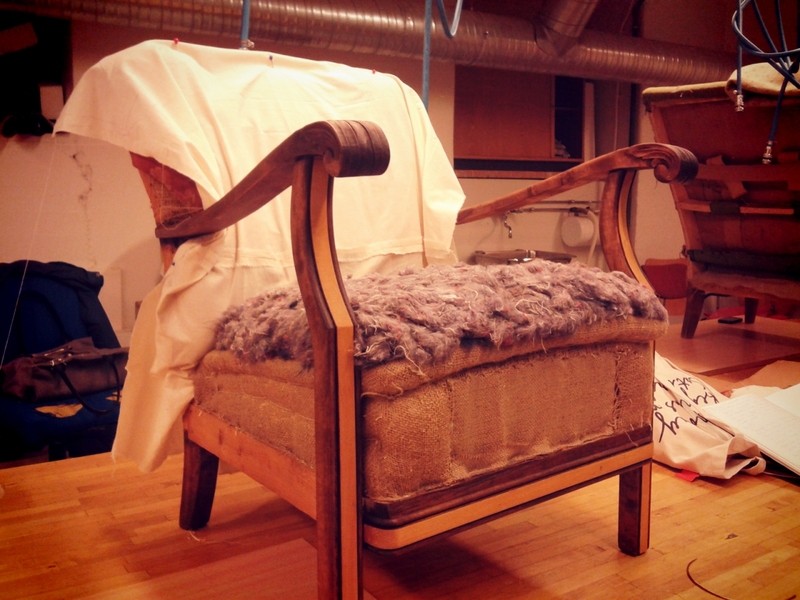 By the end of this post, there is actually real fabric on my chair! Well… just the top side of the seat though… but it’s a start. 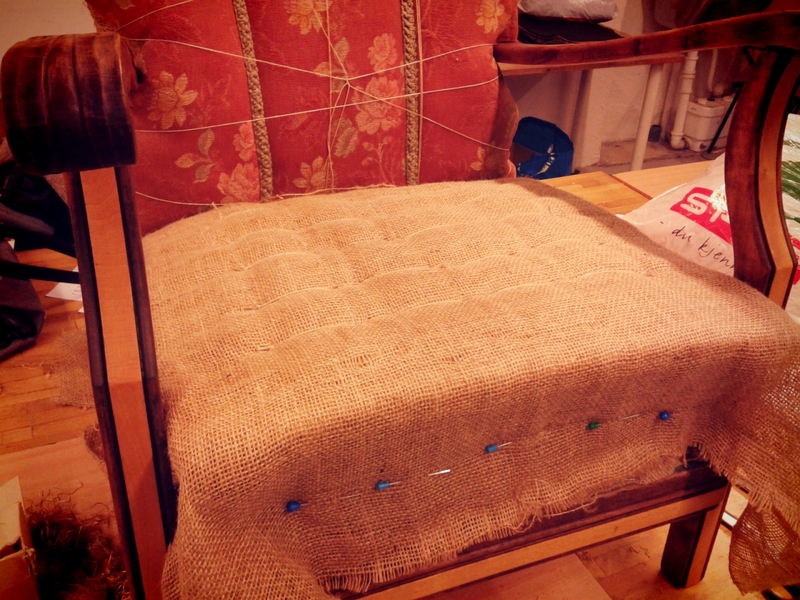 In the picture above from the previous post I had gotten as far as covering the wood-wool seat cushion with another burlap-like fabric. 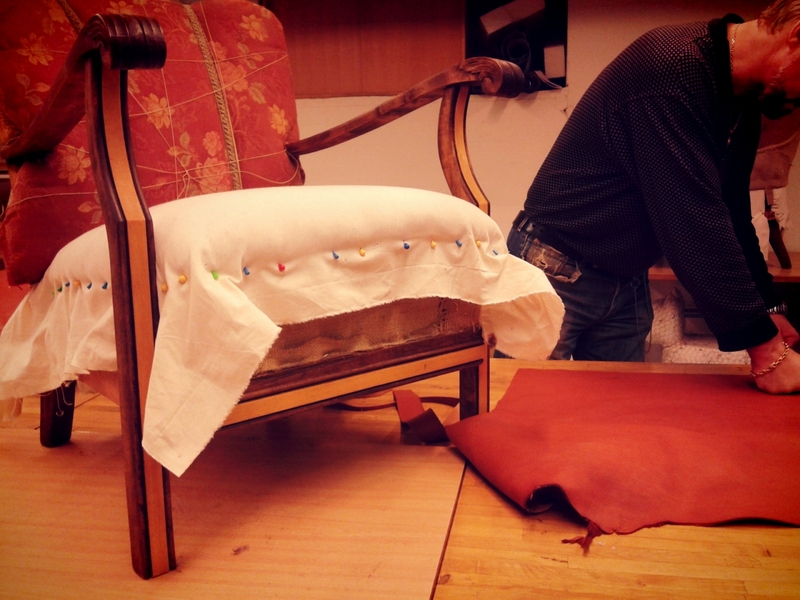 Here my teacher is showing how to stuff the sides of the chair seat with wood-wool, to help create shape and stability. The fabric on the sides gets stapled to the wool, while the front gets folded and sewn in place. 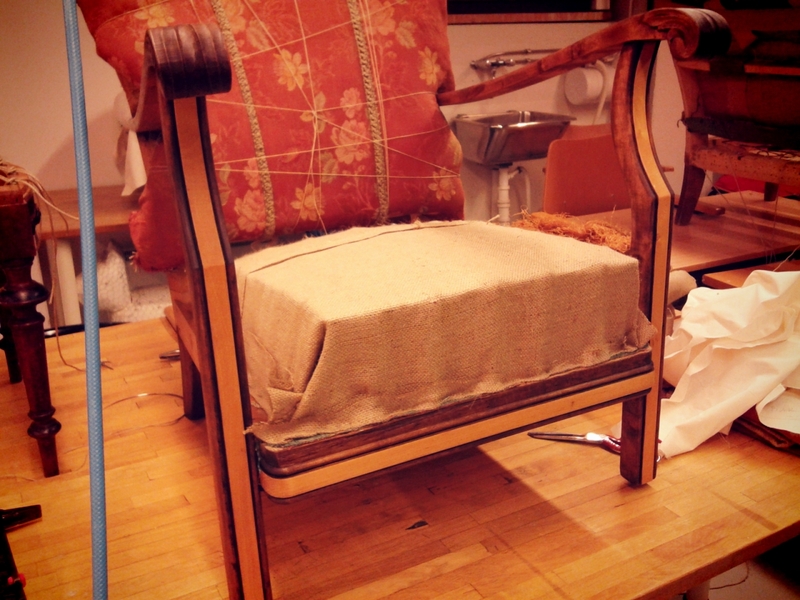 Next comes the step that makes the seat look all fancy and professional! There are three rounds of a sort of blanket-stitch, which define the edges into those sausage-looking rolls, and keeps the seat from sagging and sliding sidewards. 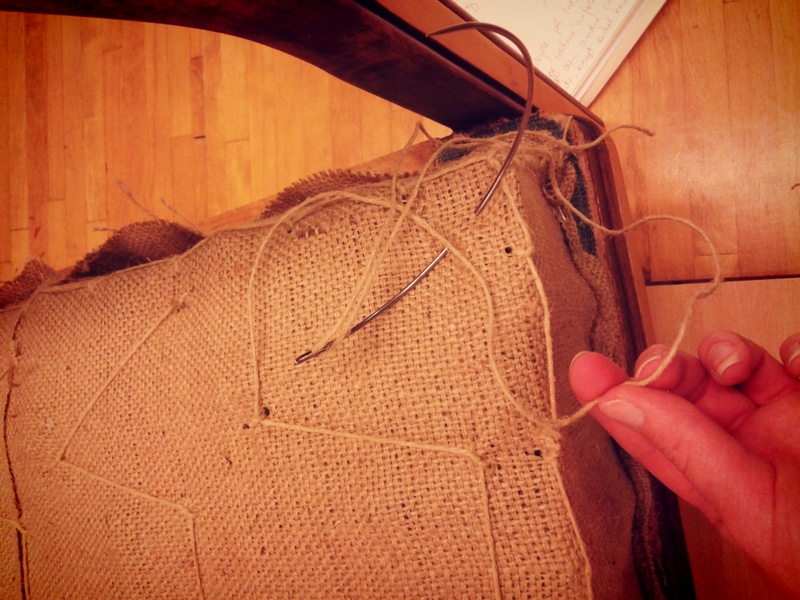 All this work with sewing with twine through tough materials is absolute murder on your hands! I was getting cuts and rugburns on my fingers from pulling on the twine to get it all taut enough. Look, look! It’s a chair! It is really exciting to get to this point, since you’re really seeing the end product being just a few steps away. The greyish mass is wool shoddy, which basically is shredded wool. There are companies that are sent discarded clothes and fabric, who produce this stuff. It makes a lot of dust. Next time I do this I think I might use a mask for this step, since you have to tear and fluff the shoddy before putting it down. Lots of dust. Distributing the wool shoddy to create a smooth and even surface is *hard*. I think it’s the most frustrating part of the entire process! The only other thing going over this muslin fabric is the final fabric itself, so any flaws and bumps and dips at this stage, will most certainly still be there with just a thin layer of fabric on top. I think I spent two whole course nights filling and rearranging the shoddy before sewing and stapling the muslin in place. It’s a test of patience, but at the same time you really want to make sure you do this step well! 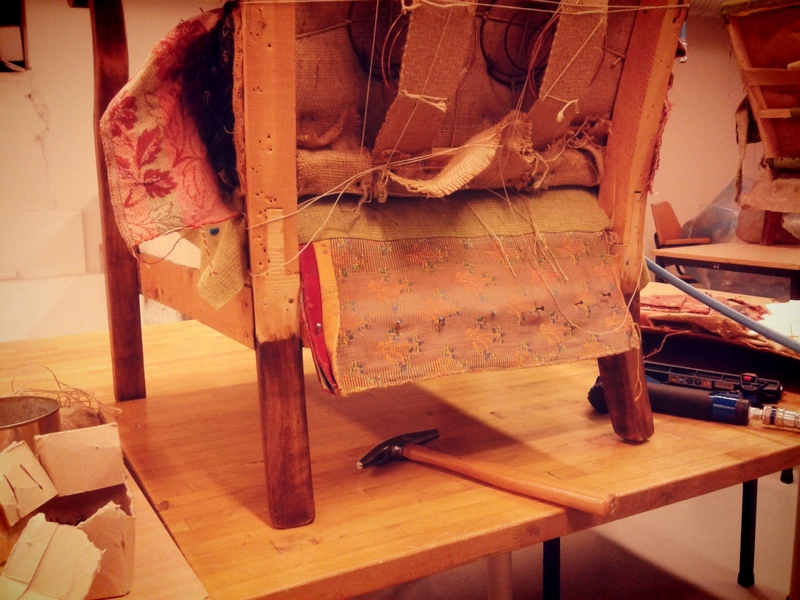 In the top picture there is a hide of leather being cut – one of my coursemates is recovering his rocking chair with leather, and it’s looking really good. 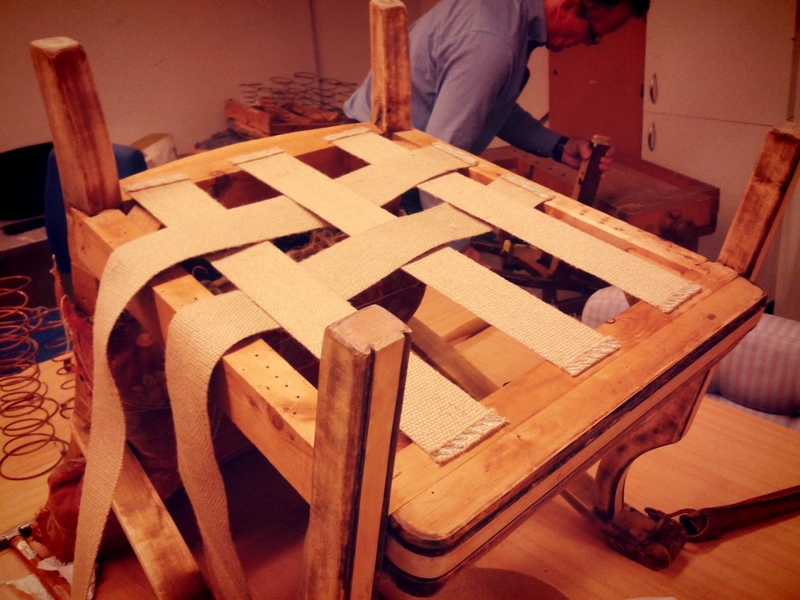 In the bottom picture, to the left, a dining room chair is being recovered. It will have a textured grey fabric for the seat and back, but with a contrasting striped fabric for the outside back of the chair. She has also sanded and re-lacquered the woodwork, so these chairs are looking all modern and in good shape again. I haven’t shown my fabric before, but here it is! It’s a tweedy and subtle plaid wool blend fabric. In the fabric store I kept gravitating towards the wool-type fabrics and a vision of a British country home library setting. So I went with it. The fabric is soft and just a little hazy, and I really like that there is a subtle pattern to the fabric so it’s not to plain. 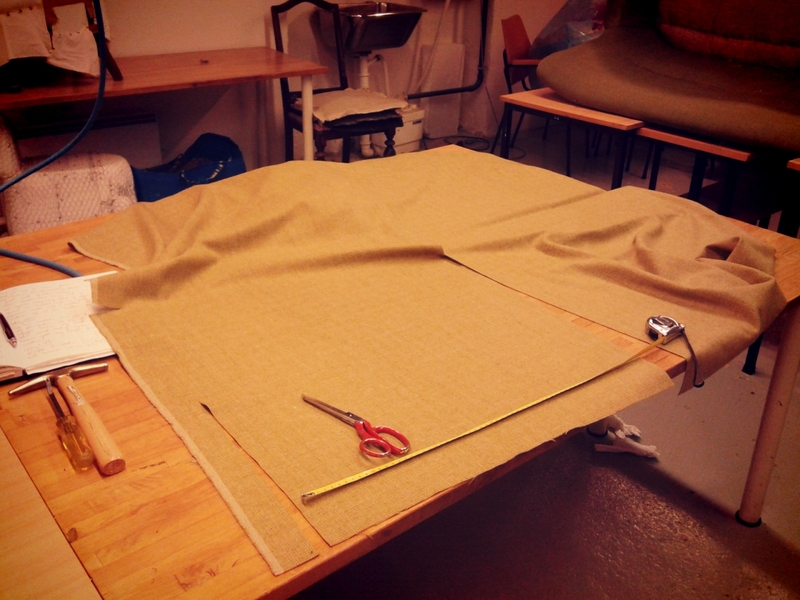 The seat cover is sewn to the layers underneath with a simple running stitch, with a small inverted pleat tacked in place at the front corners. The bottom fabric is just pinned in place here, but that’s the next step – to staple down the side fabric to the wood, and sew the bottom to the top. Here I’ve also (finally!) stripped the old red fabric from the chair back, so I can start working on that. Initially I was keeping the old wool shoddy that is in ok shape – it’s not pushed down too much – but it’s actually quite sticky and gross to the touch, so out it goes. 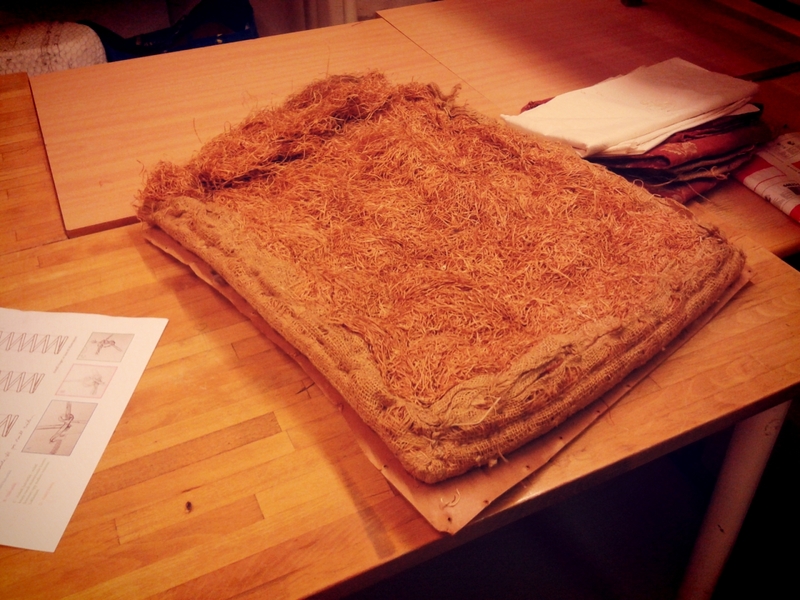 That means I’m keeping all the burlap layers and wood-wool and springs underneath, but they’re not as icky. 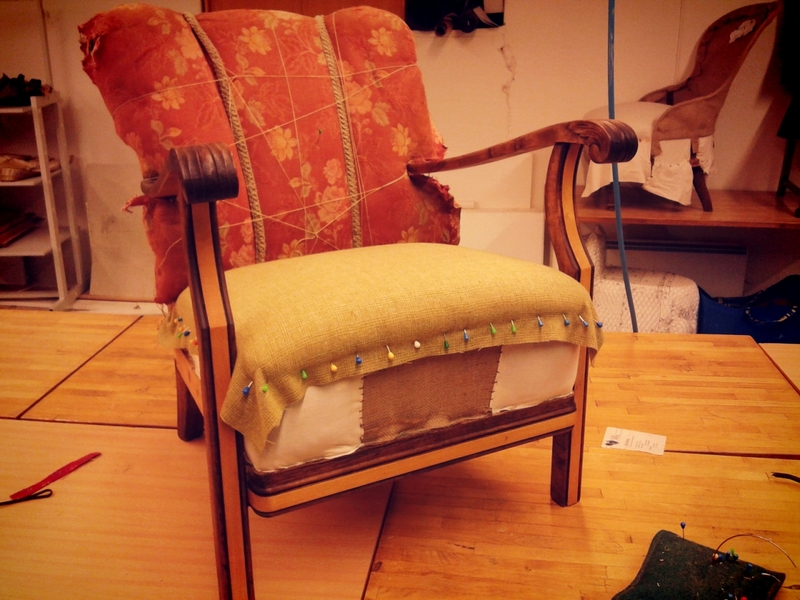 I’m excited to get the last of the seat fabric in place and nail in some decorative nails – it’ll look nearly done! If you don’t look at the seat back of course. But that’s next! Welcome to another round of red pictures! The light in the basement where we work is pretty terrible, but at least the pictures are consistent in their red glow. Anyways! The last two or three sessions has been about rebuilding the seat. 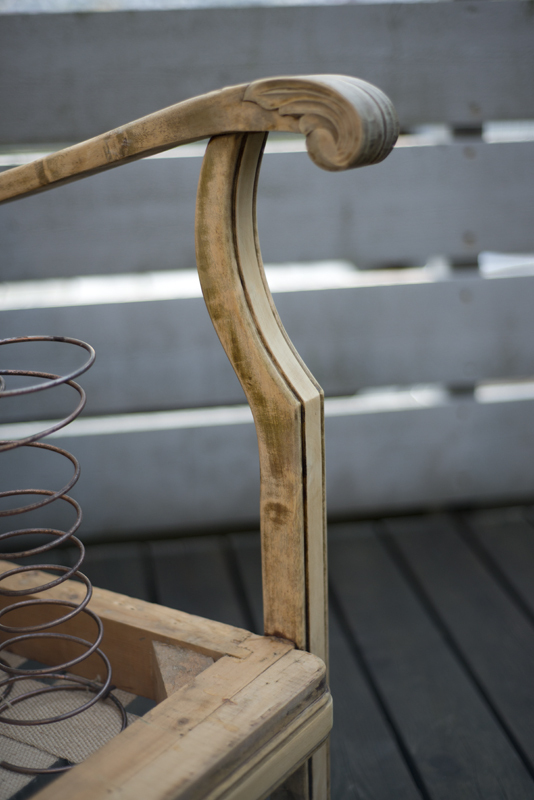 By last post I had the springs all in place, and in the picture above you can see the stitches from attaching each spring at four points to the jute webbing. It reminds me of a funky houndstooth pattern! And…. 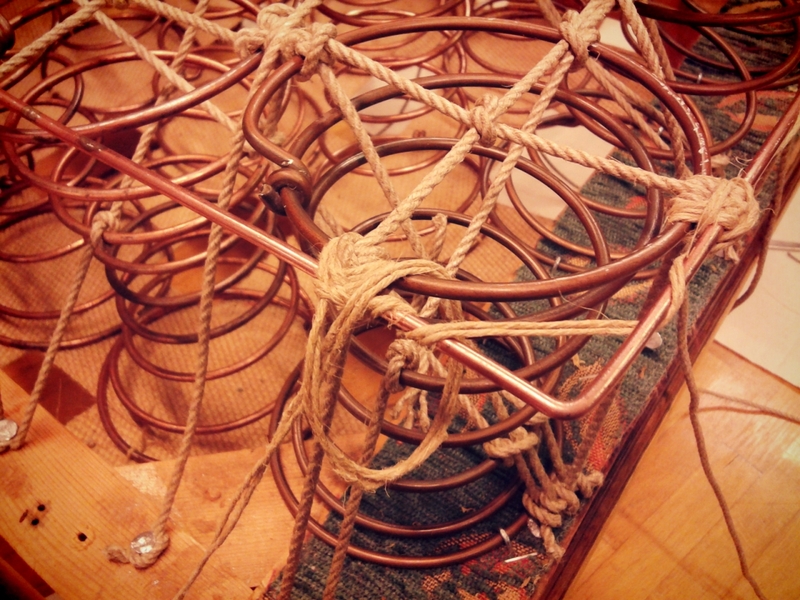 more tying up the springs with rope and string. The first pass was from the back to the front in the middle of each column of springs, then another pass left to right in the middle of each row of springs. Then a repeat of that between the springs (on both the rows and columns) between the springs, attaching to the rope itself. 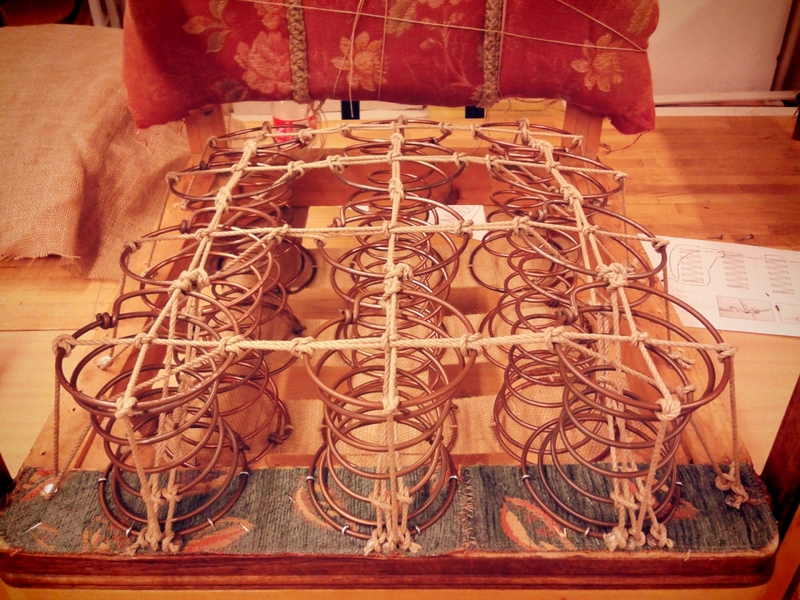 And finally, a metal wire frame at the top edge of the springs, kept in place with more string. 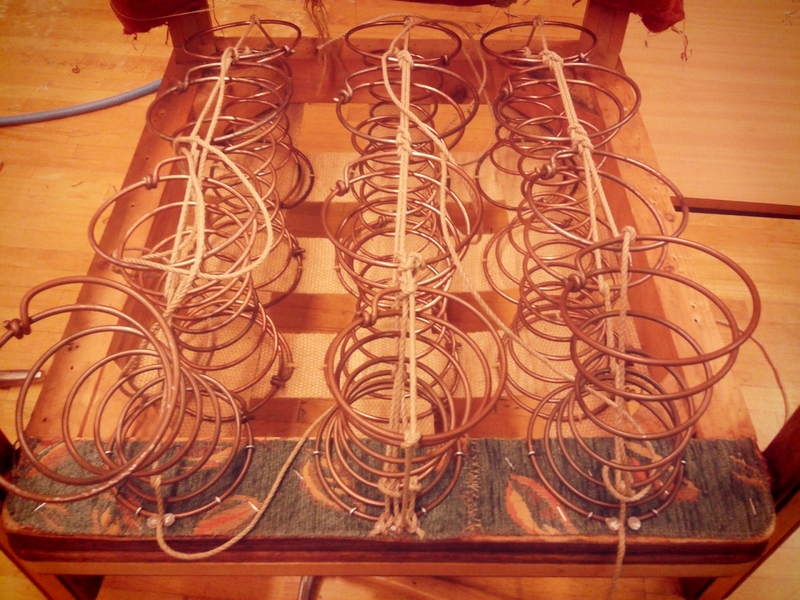 These springs are securely in place now! 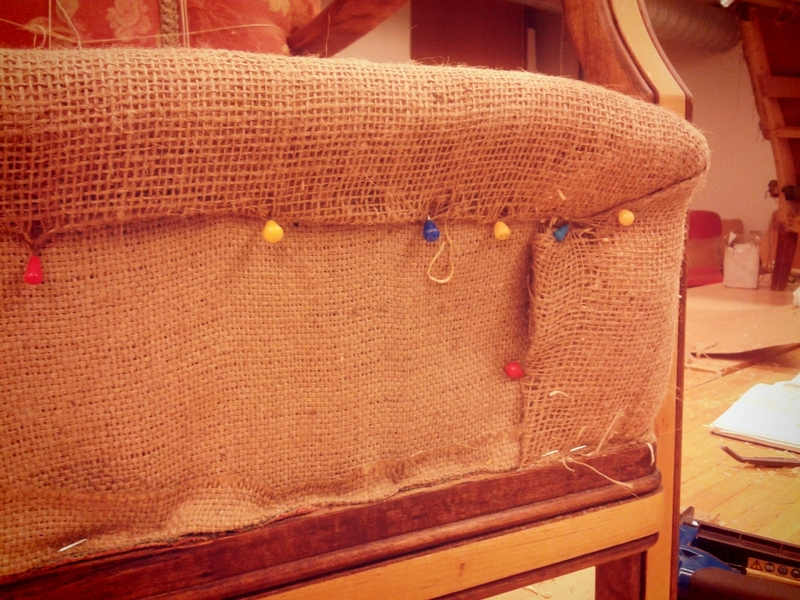 Next a base layer of burlap covers the springs, and are attached with more string and knots. 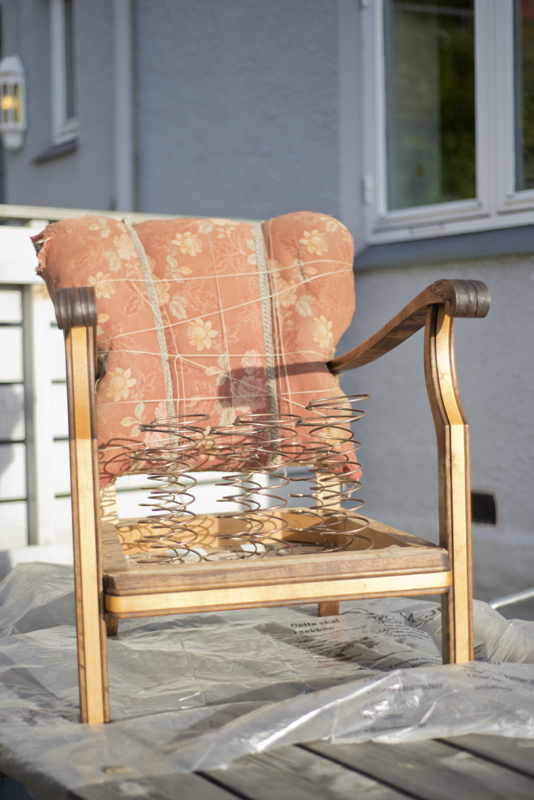 First, around the edge of the metal wire frame, and then across each row of springs catching each of them at 3 spots (8 o’clock, 12 o’clock and 4 o’clock). I took that picture to help me remember the locking stitches used for both these steps. 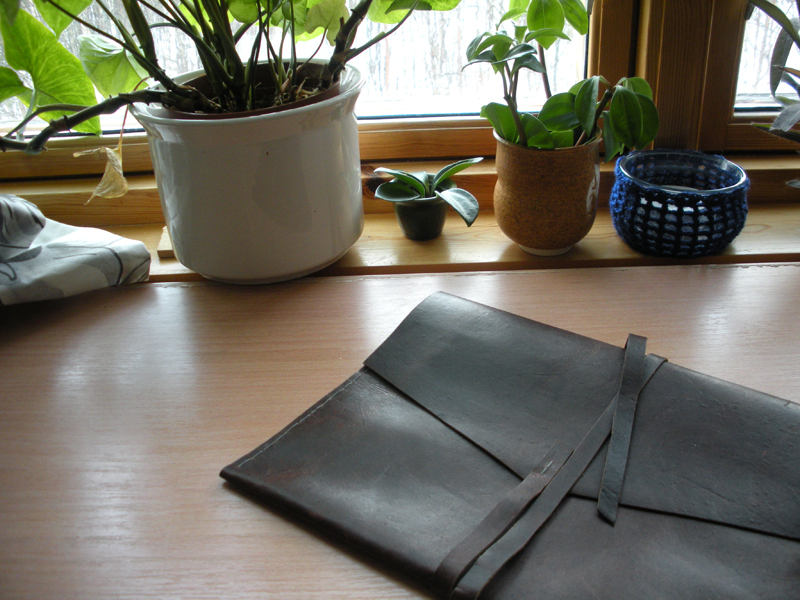 It actually reminds me a lot of a regular blanket stitch (here is post at Colletterie with a tutorial and variations). My original “wood-wool” (that’s really what they call it!) cushion was pretty intact, so I got to reuse that. 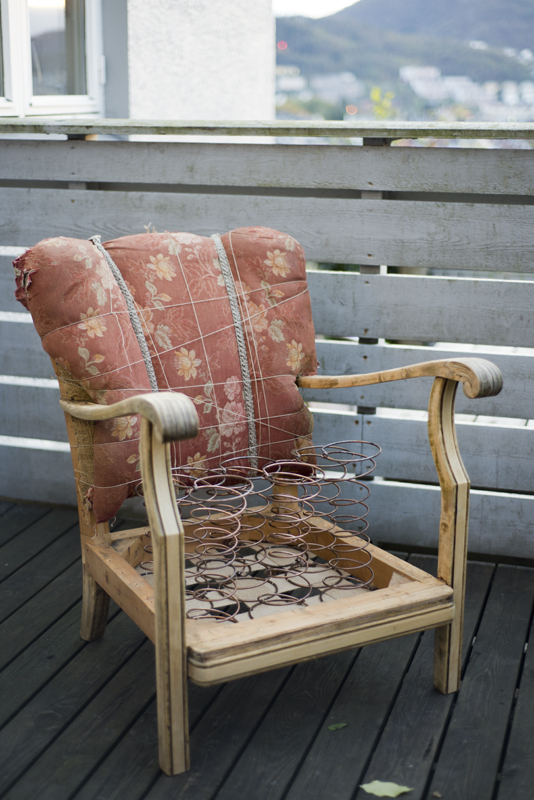 It is just positioned over the burlap covered springs, filled with more wood-wool if necessary, and then some running stitches with a crazy giant double-pointed needle secures this cushion to the burlap fabric underneath. Pulling tightly you start getting a bit of a “buttoned pillow”-look, but I think this is all being covered with shredded wool (real this time), so it won’t be apparent in the finished seat. 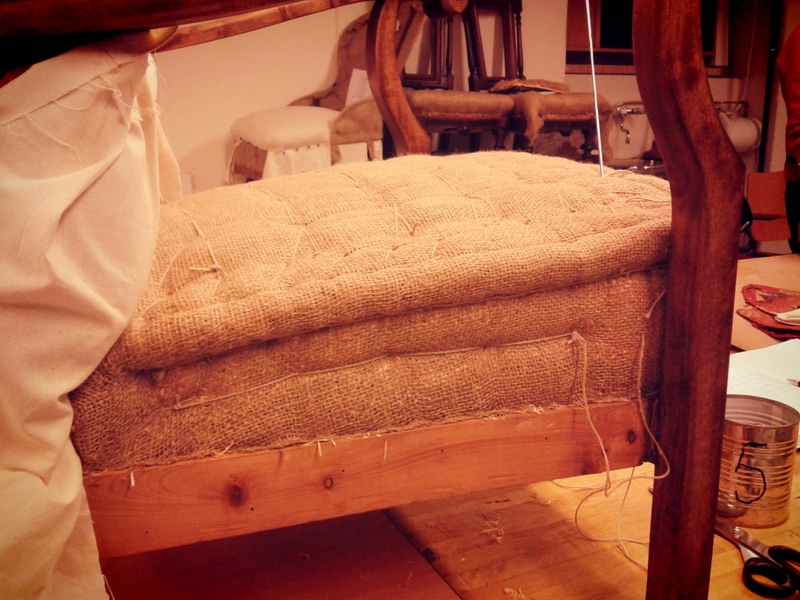 There are still quite a few steps before the seat is finished – the sides are all being filled in with more wood-wool and secured down, the burlap top is sewn to define the edge, the real wool is piled on top, then a layer of muslin, and… I think, at that point finally the real fabric. I was surprised to learn that we are finishing the seat completely before even taking the fabric off the back, so I guess I have to live with that old, red, sort of terrible fabric a little while longer! 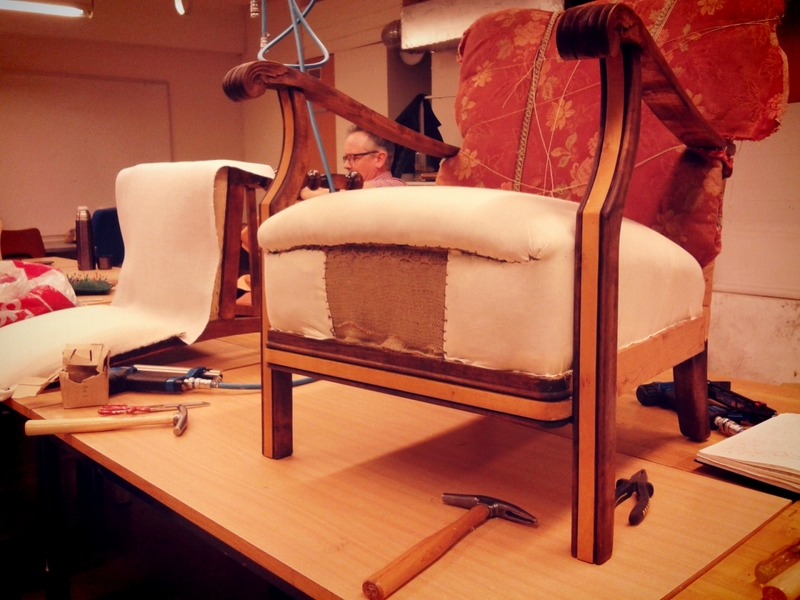 I love reupholstery class – at least, I’m coming back around. 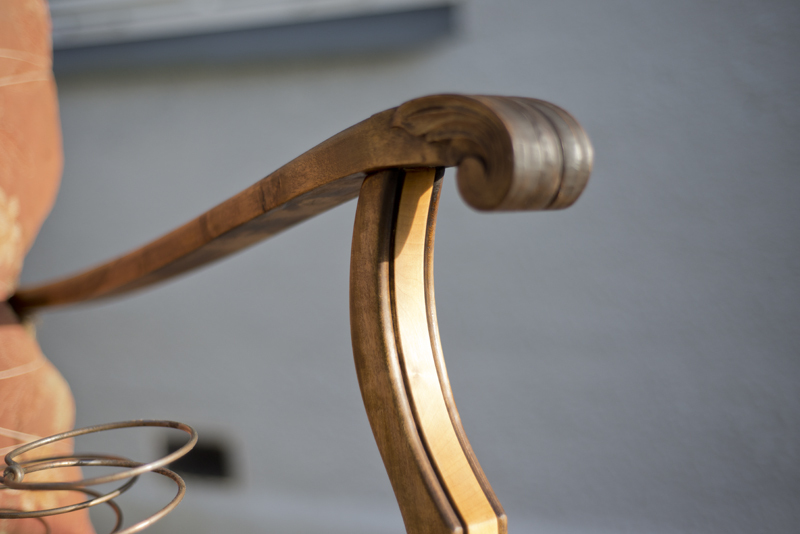 I spent several weeks carrying this chair a mile back and forth between my apartment and class, so that I could get the sanding and staining done on the woodwork. That’s been quite the pain, and taken much longer than I expected, so I haven’t been unequivocally in love with the project for a few weeks! 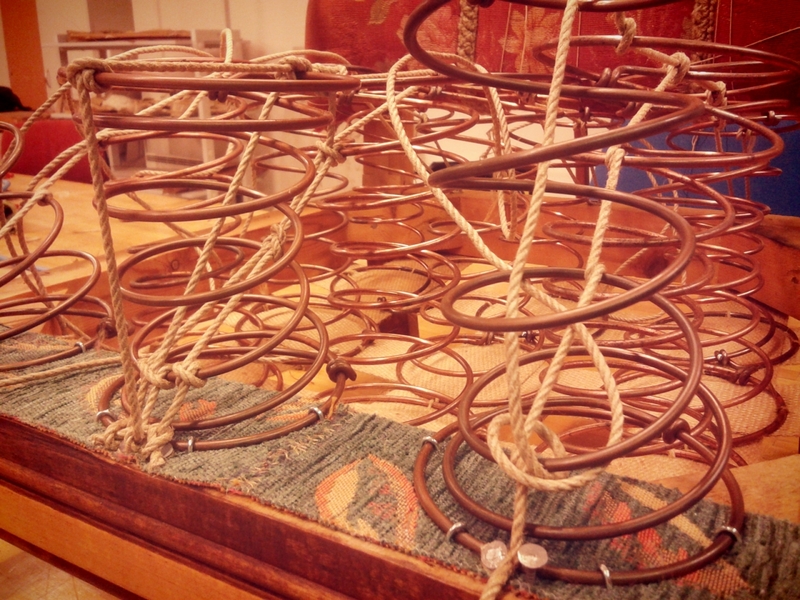 Now I’m back on track, and I figured I’d show the work on the springs, and then the sanding and staining pictures. 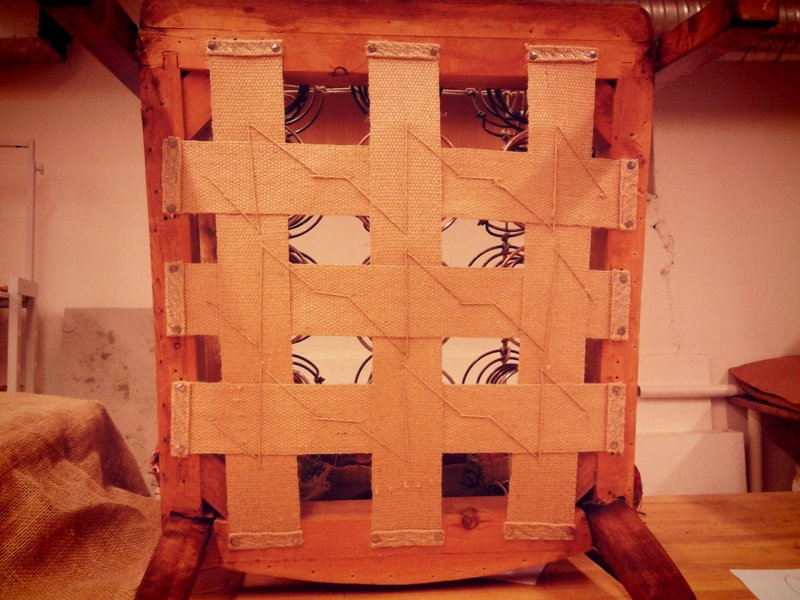 The springs are sewn with thick thread to the jute webbing, which is attached in a woven pattern. Looking at this from underneath, the second set of webbing should overlap in the center to be on top. That makes for a more stable foundation to attach the springs to. 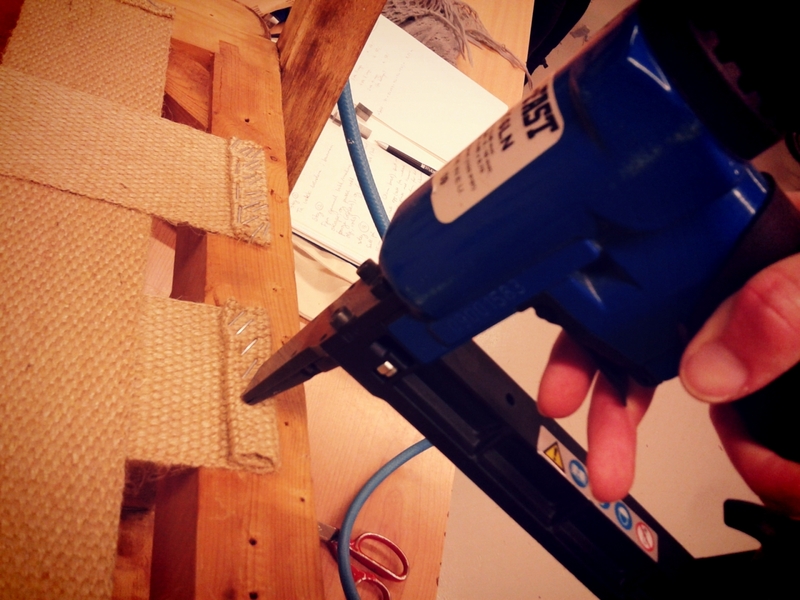 The webbing attached first with staples (that’s an air pressurized staple gun I’m using!) 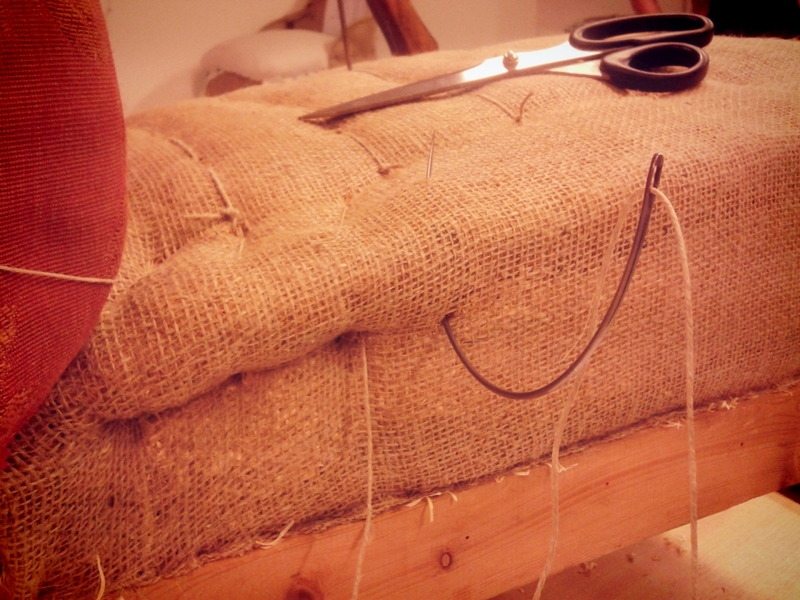 at one end, then you use a stretcher to pull the webbing taut, and then staple the other end. 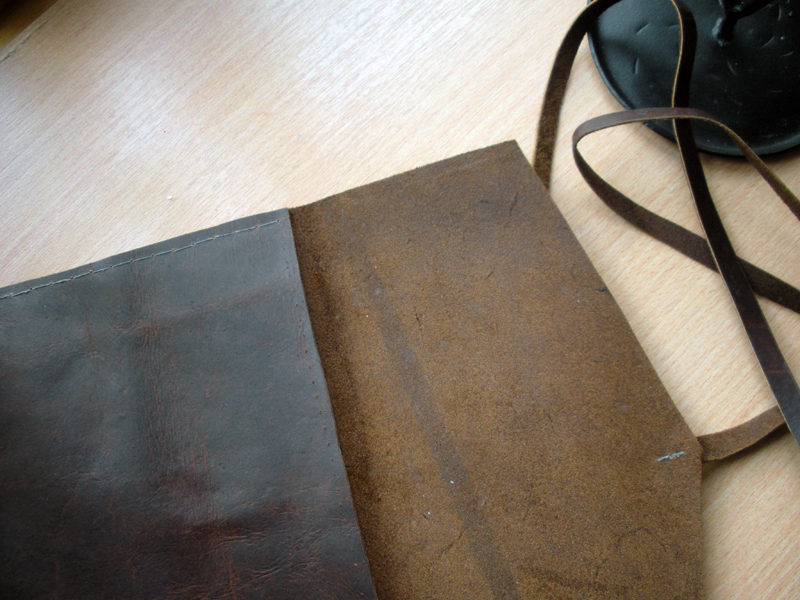 Finally it’s secured with two nails at either side of the folded over webbing. I didn’t take a picture after that and the springs being sewn on, but I’ll do that for the next post. Then the fun part! Actually it’s really confusing, and a little hard. 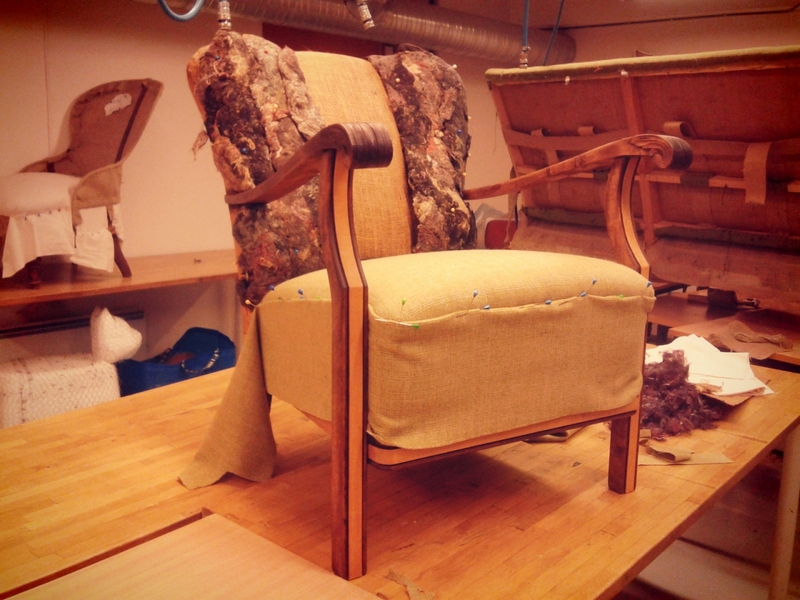 But this is the part of the process where you both get to see exactly how much knowledge and work goes into upholstery, and the start of a real seat shape to the chair. 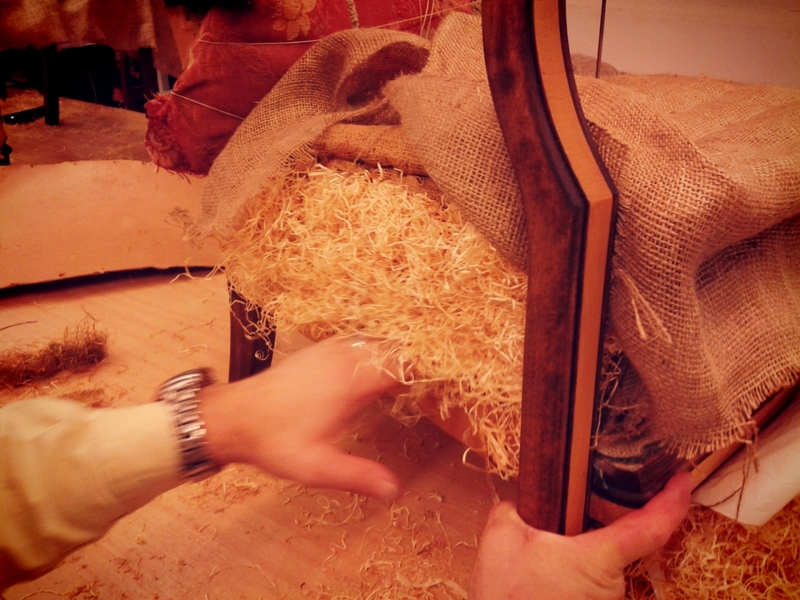 The jute rope is tied to the springs in a very specific combination of different knots at different points, to stabilize the chair seat and prevent the springs from moving too much towards each other and potentially squeak. This also controls the height and shape of the seat. I feel like a rookie boy-scout learning these new-to-me knots! 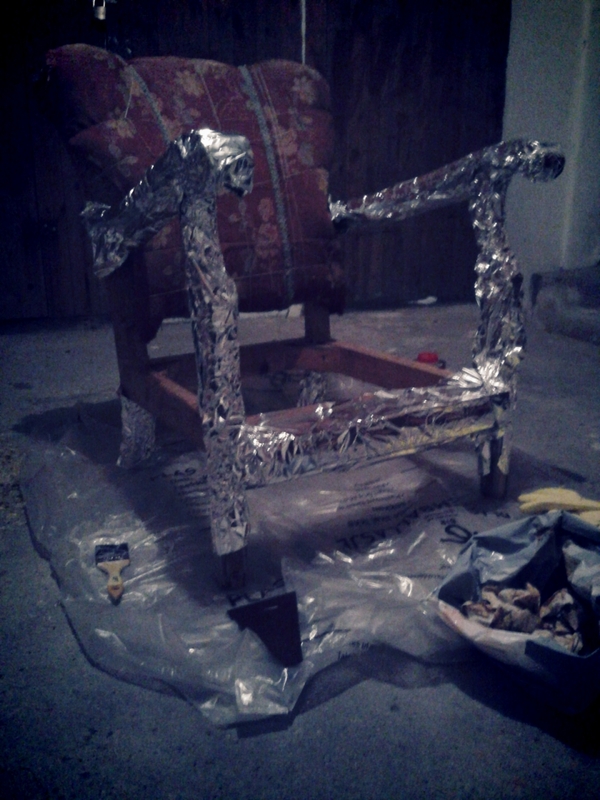 What has taken up most of my time has actually been sanding and staining the woodwork on the chair. 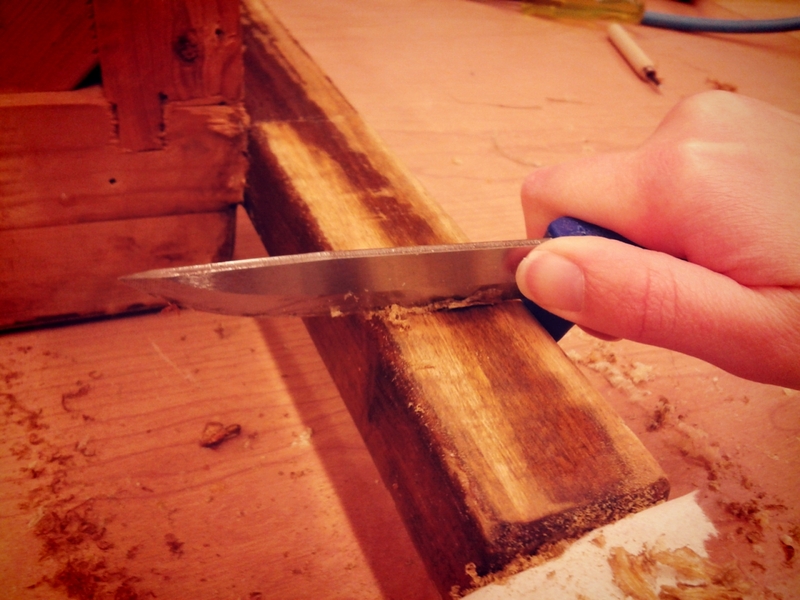 First I used a straight edge knife to shave off as much old lacquer and stain as possible. And there was a lot! There are a lot of nooks and crannies in the profiled woodwork, so I also used a chemical lacquer and paint-remover. I suspect it didn’t work optimally because of the old age of the varnish, or maybe the too-cold basement I was working in. Either way, I had to do several rounds of scraping, varnish-be-gone goo, more scraping, and goo, then a good sanding to get the wood prepared for staining. The goo covered in aluminum foil so it wouldn’t dry out while waiting for it to work. And this is what it looked like after all that varnish was removed! Before, and…..
…after! I used an oil based stain. I considered a lacquer based stain, but I didn’t want a shiny and hard finish on the woodwork like a varnish would provide. 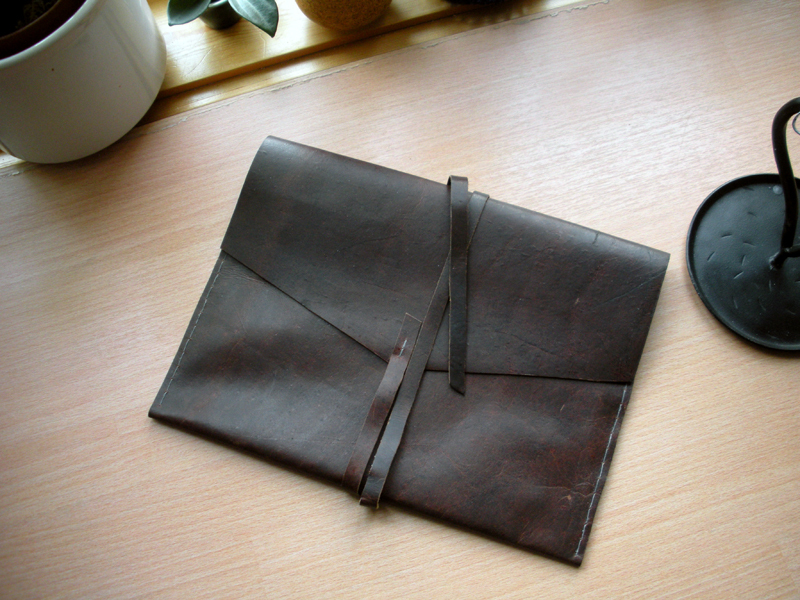 The oil based stain and finishing oil can be applied with a rag instead of a brush, and I like that aspect of it. The oil brings out the woodwork beautifully too! I used a brush to get all into the little crevices of the cut out profiles, trying really hard not to get dark brown stain on the parts I meant to keep natural wood-colored, since it would be hard to remove it again. It took a whole lot of work, very much so worth it now, and I’m so happy to be on the after-side of fixing up the wood!